"The Goddess of Victory is Always Watching You"
I'm going to tell a story about New Year's.Here's what happened leading up to the story.. Which included an adventure to Oita. Which ended with Yossi and I sleeping in a questionable hotel eating instant soba as every restaurant in the area was either reservation-only or closed for the holidays. I pull open the curtains, unveiling the first day of the new year. It's 7 am, and I was sure the sun would be up already, but a large mountain, Mt. 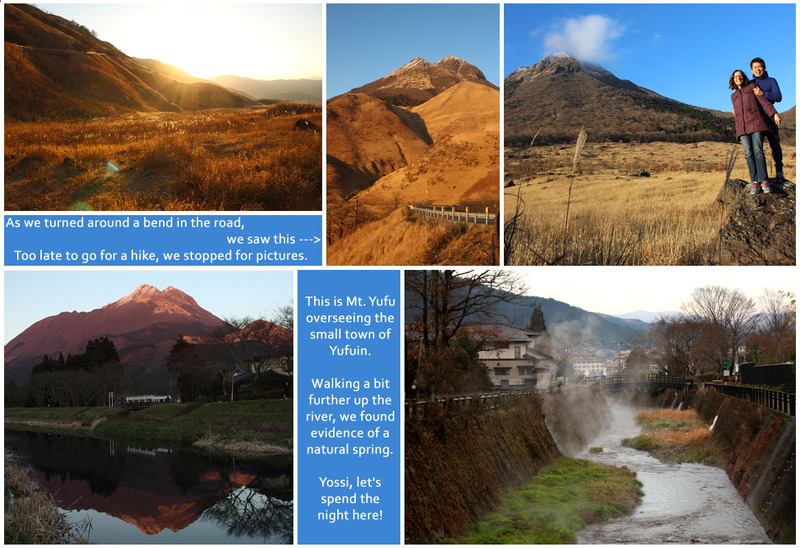 Yufu, is blocking the path of the sun and the valley is still dark. Yossi stirs in his sleep. I ask him if he's interested in doing Hatsuhinode - Watching the first rise of the sun of the new year. We'd already decided to go to a shrine first thing in the morning. The little tourist map I'd received at the front desk showed a shrine about a 20 minute walk away. Going to the shrine at the beginning of the year is called Hatsumode and it's part of the celebration of New Year's. Usually we're at his family's house, getting the kids ready, and driving up to the local shrine on icy roads. This year we've woken up early, peacefully, and curious about this place we've stayed at that we were only able to see by night. The receptionist had given me the map when we still had hopes of finding a place to eat. Yossi was going to throw it out, but I showed him the shrine on it and we decided to go check it out. The air is chill. Mountains dwarf the town. We follow the map and find that we're going alongside a river. The further we travel, we start to notice a mist about it. Eventually as the mist thickens, I realize that it's steam. I clamber down the bank of the rive to check and yes, the water is lukewarm. The further we go, the warmer the water gets, until there are clouds of steam all around us. Birds seem to enjoy wading in the warm water, but grasses and mosses slowly peter out as the water becomes to hot for them to handle. Eventually the river opens up to a pond. The whole pond is steaming! On the far side, a shrine gate is sticking out of the lake. I see that it's the one on the map. Yossi and I head over there and make our first prayers of the new year. 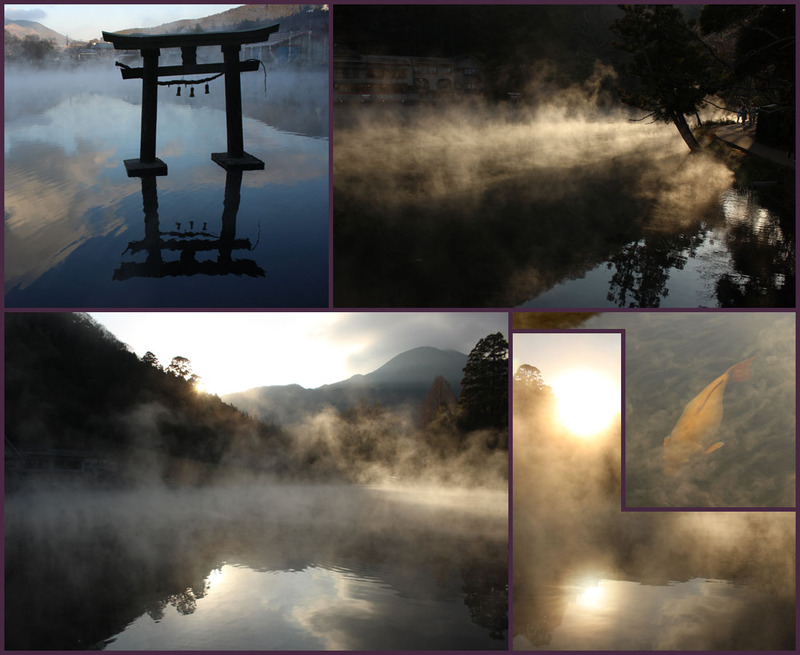 From the shrine, I can see across the lake to the hills in the distance where other plumes of steam spot the landscape. Natural springs boiling out of the mountain, no doubt accompanied by hot baths and resort hotels. Yossi and I walk the perimeter of the pond, admiring the scenery. When we've come in a full circle, I stop. Here's where we'll wait for Hatsuhinode. It takes forever for the sun to rise, but despite being in a cold mountain valley, the air is warm with steam and we don't mind waiting. We bow to the sun as it tops the trees and I take some pictures. Of all the shrines we could have chosen to go for Hatsumode, we happened upon this magical hot spring! Other tourists from the nearby hotels begin showing up, but the steam wafting between us seems to wall off everyone in to their own quiet space.